Bachelor of Architecture (B.Arch.) is a five years undergraduate program which can be started after 10+2 with minimum 50% marks. This course is designed to produce licensed and professional architects who are authorized to do private constructions and government constructions. Average fees for this course in government colleges ranges from INR 1.5 to 2.5 Lacs and in private institutes, it ranges from approx. INR 2.5 to 5 Lacs. After the successful completion of this course, the students can pursue their career in architecture sector with the average salary range between INR 2.5 to 4.5 LPA. Architectural study includes the activity of designing models of building, preparing construction’s blueprint and other physical structure of any land and building. The increasing demand for constructing shopping malls, flyovers in cities and other commercial complexes can be fulfilled by the role of an architect. INR 2.5 to 4.5 LPA. Bachelor of Architecture: What is it about? B. Arch. is a technical course study which mainly focuses on the development of the skills which are required to become an Architect. Students learn the process of construction of commercial buildings, malls, complexes, highways construction and civil construction by applying their innovative ideas and analytical skills. It also includes the theory and practice of designing process and as well as the commercial drawing techniques. What are the skills required and who should opt for this course? The activities of an Architect are different in each project or assignment but it is enjoyable. Mainly the skills required in this course are drawing skills, analytical skills and constructing skills. It also requires practical skills rather than theoretical skills. If somebody is fond of doing a different kind of activities every time by his/her own then they should opt for this course. As compared to clerical work, this course requires initiative abilities, challenges-accepted attitude, and hands-on-work style.The duration of this course is five years after 10+2 or equivalent with minimum 50% marks in aggregate. A variety of higher study options are available after this course. But the most relevant and beneficial study option is M. Arch. (Master in Architecture) which focuses on the specialization in architecture career. Monitoring building system like lighting, fire evacuation, security systems etc. 10+2 or equivalent with minimum 50% marks along with the compulsory subject of mathematics. 10th + 3 year’s diploma in any stream from a recognized university/ board/ institution. The students can get admission in B. Arch. 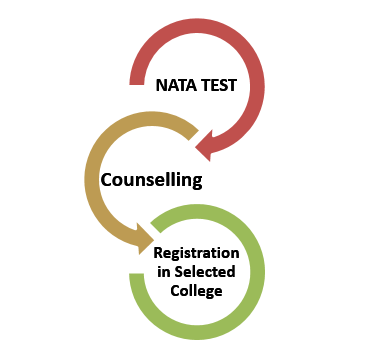 by appearing in NATA entrance exam which is conducted by Council of Architecture every year and qualifying examination from a recognized university or board. There are various colleges which are taking admission of students through this entrance exam.